Brave New World: Do Bookshops Have A 2020 Vision? We have all read about the decline of the independent bookstores in the UK and US. 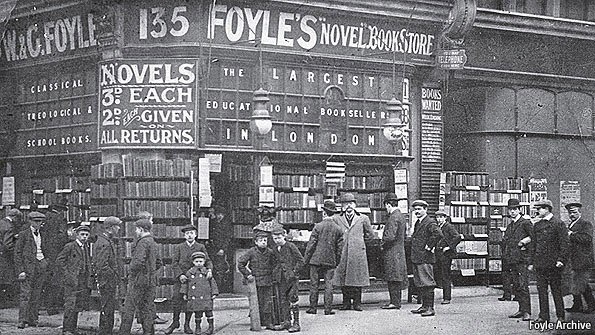 However, we have also seen the relaunch of Foyles in Charing Cross, the expansion of the Hatchards brand by Waterstones to St Pancras, the growth online of the bargain bookseller, The Works. So what is the future of the Bookstore and does it have a vision of itself in 2020, or is its vision somewhat out of focus and requiring both short and long sighted correction? Today more than ever before that quote reflects the significant changes and challenges facing booksellers. Some would say that the question of what is sold, is as important as that of how it is sold. Today many continue to sell not just a narrow range dictated by their physical square footage, but a range focused purely on the new or only available through the publisher. It’s as if they haven’t read what it says above the door and have ignored the word ‘bookseller’ and replace it with ‘new books only seller’. Books are books and the consumer doesn’t grab a book and turn immediately to the copyright page and look as to when the book was published, so why do so many bookstore restrict themselves? In a market that over produces both in titles and quantity, there are many mint condition ‘bargains’ to be stocked from outside the traditional publisher channel. They may not have the ‘sale or return’ safety net, but they also can be often acquired at a fraction of the price. One of the salient lessons we should have learnt by now from the likes of Amazon, is that consumers want to buy new, old, rare, bargain and used books and to do so from one place where they can seen the full range. A recent article in The Economist looked to the future design of the bookshop and asked four firms of architects and designers to create the bookshop of their dreams and in doing so reinvent it for tomorrow. The designers looked at many aspects and even covered the sale of used and digital books and using the space to sell lifestyle, create theatre and host events. It is worth a read. However, they started from the premise that the hub was the bookshop and everything revolved around the book. Is that how we should look at it, or is the book merely part of a larger proposition based around a wider lifestyle offer? This obviously raises the question of range both in terms of width and depth. We have seen many acclaimed bookshops which have narrowed their offer to appeal to a segment of the market, but how many of these have actually complimented their book offer with a full range of products that appeal to that same segment? Does the cookery shop sell cookery product and books, or books and cookery product? Does the children’s bookshop sell toys, children’s clothes, prams etc. alongside books, or books alongside childrens’ product? Ex Borders UK head, Phil Downer has made his Calliope gift shop one that sells gifts which include books and in doing so he is able to cross sell and merchandise and adjust his offer to suit the market. Will books be a major or a minor element in years to come will depend on many factors, but ultimately it should reflect consumer demand. The coffee shop within the bookstore is often a very good earner per square foot and creates lifestyle and greater selling opportunities. It is claimed that our obsession with coffee houses is going to grow by a further 20% by 2020. So would you open a coffee shop that sells books or a bookshop that sells coffee? A further example of how market trends have changed well established markets is in the off licence sector, where the supermarkets have come in and not only wiped out much of the previous retail space, but also have actually expanded and grown the market. When supermarkets first started selling petrol it looked obvious and was restricted to their out of town supermarket locations, but now some have taken their supermarket offer to the garage forecourt and taken over independent stations which are convenience stores that sell petrol and this has enabled them to grow their convenience business and opened new locations miles from their supermarkets. Just focusing on books is obviously a very limited consumer offer. Just selling new books could be terminal. There's a great deal of common sense here - the best bookshops I've ever been in were those with 'add-ons' - from a minsicule one on Mull to a converted cinema in Waterford. Waterstones may be moving to this model - but the recent edict to ban author signings in store is a retrograde step. thank you and i would suggest reading a couple of books. One is the Life and Times of Robert Dodsley who was the owner of Tullys Head in the 18th century and start to redefine Bookselling and realised the power if copyright as he moved more to wards what we recognise today as publishing. The other book is by Thomas Joy and was published in 1964 and is called The TRuth about Bookselling. The Joy book describes an era when booksellers were struggling, was pre the aggressive chains, out of town outlets, was at a time the NBA was sanctioned and Booksellers needed to adapt to survive. Interesting how what goes around comes around.